The names roll off the tongue like it’s a Sunday morning in 1966, and Lindsay Nelson is bringing the nation yesterday’s Notre Dame football triumph. Terry Hanratty. Jim Seymour. Rocky Bleier. Nick Eddy. Larry Conjar. Alan Page. Kevin Hardy. Jim Lynch. Can it really be 50 years? How many kids across the Midwest – and the nation – sat mesmerized in front of their TV sets – many in black-and-white, marveling at this team? This was the team! This was the school! There’s no place like Notre Dame. There simply couldn’t be. The 1966 Fighting Irish rank with the all-time greats. Yes, it’s unfortunate that so many general sports fans can only name the epic 10-10 tie with Michigan State, which brought controversy along with a consensus national championship. This Saturday evening, when dozens of 1966 team members, along with their venerable head coach, 93-year-old Ara Parseghian, take the field at Notre Dame Stadium, the memories will come flooding back. Michigan State is the guest. How could it be otherwise? Amazingly, 12 players off that team received some kind of All-American recognition, including eight on at least one selector’s first team. Many went on to careers in pro football. One need only look at the defensive production to know this squad was special. They allowed 38 points – for the season. More than a third, 14 points, came in the opener, a 26-14 win against No. 8 Purdue, led by Bob Griese. There were the 10 points yielded to MSU. Single touchdowns to Northwestern and Navy. And six shutouts. In 10 games, Wins over Army (35-0), North Carolina (32-0), No. 10 Oklahoma (38-0), Pittsburgh (40-0), Duke (64-0) and No. 10 Southern Cal (51-0), the latter the most one-sided result in that series history. 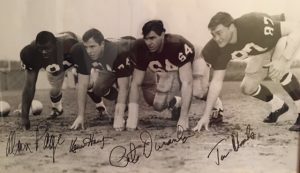 The defense was led by a staunch front four, featuring three All-Americans: Alan Page at one end, and Kevin Hardy and Peter Duranko at the tackles. The other starting tackle, Tom Rhoads, marveled at the talent – and spirit – of the Irish as he spoke to us this week. “We just had a great group of guys,” said Rhoads. “We love one another; we watch out for one another. We might see one another only once every five years, but you’re still thrilled to see whoever is still standing,” Rhoads said. Sadly, one teammate “no longer standing” is Duranko, who died in 2011 after a decade-long battle with amyotrophic lateral sclerosis (Lou Gehrig’s disease). Michigan State coach Duffy Daugherty and Ara Parseghian before the famous 1966 10-10 tie. Hardy will not make this weekend’s reunion, owing to recent health problems. And Alan Page chose long ago not to include football reunions on his extremely busy schedule, which has included a Hall of Fame career with the Minnesota Vikings, and a long, distinguished law career culminating in some 20 years on the Minnesota Supreme Court, including several years as Chief Justice. Page also founded the Page Education Foundation, which provies financial and mentoring assistance to students of color in exchange for those students’ commitment to further volunteer service in the community. 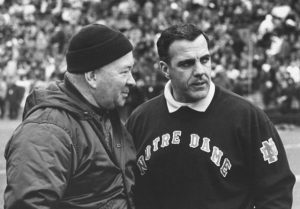 For all members of the ’66 Irish, Coach Parseghian provided guidance that stood the test of time. That’s true for All-Americans, reserves, even the senior student trainer. That was the role of Joel Maturi, a fine athlete from Chisholm, MInn., whose injuries precluded a playing career with the Irish. “I always had an ambition to coach. I remember, after Ara was hired in 1964, walking across campus as a freshman, going to see him, to see if I could have a role with the team. He welcomed me, and for that I will always be grateful. Maturi went on to a highly successful coaching career at Madison (Wis.) Edgewood High School, then became assistant and later associate athletic director at the University of Wisconsin. He oversaw the resurgence of Badger football under former Notre Dame assistant coach Barry Alvarez. From Wisconsin, Maturi became athletic director at the University of Denver, Miami (Ohio) and finally the University of Minnesota, from which he retired after 10 years in 2015. At each stop, lessons learned from Notre Dame days came into play. He recalled the time in 1966 when the super sophomores – Hanratty and Seymour – were pictured on the cover of Time magazine. “Coach was not happy about it,” Maturi recalled. “Nothing against those two, but he would have preferred his seniors get the publicity….Lynch, Page, Eddy. Looked at that way, lots of student-athletes in lots of places have learned from the wisdom and leadership of Coach Parseghian. For the members of the 1966 Fighting Irish, it all added up to a season that will be celebrated as long as football is played at Notre Dame.